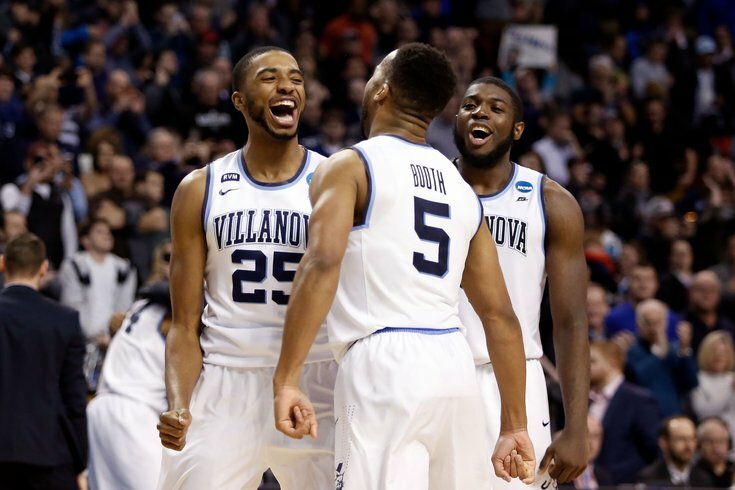 Villanova Wildcats guards Mikal Bridges and Phil Booth celebrate after advancing to the Final Four. You didn't exactly need a lot of time to digest Philadelphia's lack of movement in the 2018 NBA Draft lottery. They stayed exactly where the numbers suggested they would stay at No. 10, and nobody was going to throw a parade or drive down the street blaring their horn at the thought of Mikal Bridges joining the Sixers this summer. But Tuesday night's lottery does bring a whole lot of clarity to the table for Philadelphia, and with clarity on the draft board we can all participate in everyone's favorite yearly exercise: mock draft season! There's nothing the basketball world likes to obsess over like made-up rankings of prospects and where they could be headed. This year's draft will be no exception. In a strange way, Philadelphia's position at No. 10 leaves them with a lot more openings and possibilities than they would have at No. 1. The conversation would have started and likely ended with Real Madrid's Luka Doncic, with many of the bigs at the top of draft boards being pulled off the table for Philadelphia. DeAndre Ayton might be a tantalizing prospect, but there's almost no universe in which he would have coexisted with Joel Embiid and Ben Simmons. At No. 10, the Sixers will be outside the top talent tier but sitting there with a range of interesting prospects and outcomes. As we all gather intel on the best players out there for Philadelphia to consider, here's what some of the internet draft cartel think the Sixers could (and perhaps should) do with their top selection. When appropriate/available, I'll also include blurbs on what the Sixers could do with their own pick at 26. You should get used to seeing the local product's name connected to Philadelphia. The vast majority of outlets are slotting Bridges into that No. 10 slot, and for good reason. Getting an athletic wing who can knock down threes and defend at a high-level is one of the team's biggest priorities moving forward. Now here's where I'll interject, and a point I'll continue to raise throughout the draft process: I'm not sure that shot creator bit is true. What we saw in Round 2 against Boston was a Philadelphia team devoid of secondary shot creation on the perimeter, to a degree that inserting T.J. McConnell into the starting lineup ended up being a necessary step for Brett Brown. The Celtics basically took Philadelphia's wing players out of the series, because none of them were players who could create shots with their handle or do much more than catch-and-shoot. It helps to have players who don't need the ball to be effective, but there's a logical limit to how effective a roster can be if it is devoid of secondary shot creation. As Givony notes in his write up, there's a decent likelihood the Sixers either a) don't use this pick or b) prioritize finding a player to stash with it. There are only so many open spots for minutes on the roster, and adding a late-first talent isn't likely to be the difference between winning a title or not. No big developments or surprises here. Parrish sticks with the conventional wisdom and puts a future member of the starting lineup in Philadelphia. I'm not sure any non-freshman helped himself more this season with NBA people than Bridges -- who averaged 17.7 points and 5.3 rebounds while shooting a career-best 43.5 percent from 3-point range in 32.1 minutes for a Villanova team that won the national title. More than anything, the 6-7 wing spent the season making "pro shots" more regularly than ever and doing most of the things any franchise would want him to do at the next level. His ability to guard multiple positions makes him somebody who could theoretically contribute to a playoff team, like the 76ers, on opening night. The next guy on this list figures to be, well, a little more controversial. Fair enough points, and Allen will certainly do alright for himself as an off-ball player in the league. If the draft shakes out the way Parrish imagines it, however, I'd be more inclined to take a look at someone like Jacob Evans from Cincinatti. He can give you a lot of the same off-ball shooting with some defensive upside, which seems like a more valuable use of a late first than a one-way player on his best day. Philadelphia can breathe easy after keeping this pick away from Boston (it would have conveyed had it leapt to No. 2 or 3), and should be looking to complement their established core talent. Bridges may be an ideal fit for the Sixers, who play more of a fluid positional style with Ben Simmons at the point, and could use an athlete like him to help run the floor. This Bridges is very much an eye of the beholder prospect. A cynical viewer will scoff at his shot selection and the inconsistency of his defensive play, thinking he's the sort of guy who doesn't have the right makeup to get it going at the next level. Alternatively, there's a lot of untapped potential in Bridges, and he has the athleticism to do big things if he's ever able to put it all together. The tweener label he's stuck with matters a lot more on defense than offense in the modern NBA, but I fall somewhere in the middle on the MSU edition. I'm not sure he has the handle to consistently create on the wing, and that's going to be exposed as he plays less four at the pro level. I'm not going to sit here and pretend I was watching a big man for Maryland play much basketball this season. You'll have to decide if you trust Woo's judgment here. Backup big man is a spot where the Sixers need an upgrade, and it doesn't look like Richaun Holmes is going to be that guy for them long-term. If Fernando fits the bill there, go nuts. With combo guard size and the ability to succeed on and off the ball, Milton is a name you should see connected to Philadelphia plenty leading into June's draft. I would guesstimate there's just about zero chance for the Sixers to invest a top-10 pick in a player who has little likelihood of starting for the team over the long-term — barring an injury to Embiid, that is. Carter would fit within the "best player at all costs" mindset the Sixers employed under Sam Hinkie, but that was undertaken because the Sixers did not have their star players yet. This is a much tougher sell now. But let the folks at The Ringer — spearheaded by Kevin O'Connor, Danny Chau, and Jonathan Tjarks — talk you into Carter as a prospect, in this series of blurbs provided by O'Connor. Building toward a future in which twin towers lineups are a best-case scenario for a top-10 pick doesn't seem like a wise use of resources in 2018. I understand the value, but don't think this is the move. Now this is a player who would fit like a glove with what the Sixers want to do. A two-time Defensive Player of the Year as a guard in the Big East, Thomas' oversized wingspan allowed him to man both guard spots in college and build a rep as one of the peskiest amateur defenders out there. I even spotlighted him in our NCAA Tournament watching guide back in March. Elite perimeter defender who moves quick laterally, can switch onto wings, and combines good technique with intensity to neutralize opponents. Strong frame with thick legs and a long wingspan enables him to battle on post switches and rebound at a high level for his position. Plays and looks like a strong safety off-ball; quickly closes out to intercept passes and pickpocket ball handlers. Turns defense into offense with steals, deflections, and rebounds. The concerns with Thomas' handle and shot creation ability are real and will be what hold him back from going as high as he might otherwise. That said, he would represent excellent value in the back half of the first round, and offer a lot of the defensive tenacity McConnell brings with more upside as a shooter and finisher — and of course, better tools to impact defense across multiple positions. The Reading native will be a fascinating case study when the draft rolls around, representing part of the argument of betting on tools vs. believing in guys who offer tangible production, athletes or not. Walker looks and often flashes like the part as a scorer on the wing, which is what intrigued scouts in the first place when he headed to Miami. There are some who still believe in him, though even Wasserman admits he would be a bit of a reach at No. 10. Walker will definitely benefit from the increased spacing and style of play the NBA offers, but the Sixers are looking for players at No. 10 who can provide that spacing. He didn't shoot the ball particularly well during his lone year at Miami, and his free-throw percentage in the low 70's doesn't offer concrete proof that he'll grow into a lockdown shooter over time. Is the lack of production a red flag for Walker, or more a product of returning from a torn meniscus? Answering that question will be critical for Philadelphia and other teams with mid lotto picks to answer during the draft process. He could end up being a steal in the middle of the first, but the risk is fairly significant for a top-10 selection. I'm pretty in on Thomas as a late-first target, provided he's there. We'll see whether he's important enough for Philadelphia to bring him in for a draft workout between now and late June.